Ok, so the ice cream at Fusciardi's in Eastbourne got me a-thinking. Brighton has got to have the good stuff too, huh? 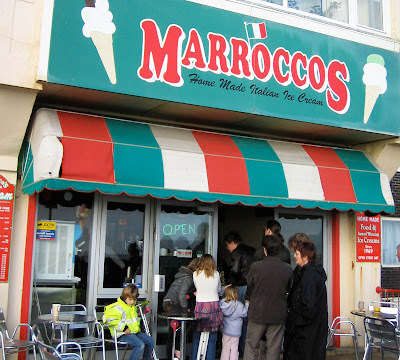 Then I remembered walking past Marrocco's a couple of years ago and thought I should pay it a visit. The interior is cool. I love the little retro booth seating and it is as close to a classic café you will get to in Brighton. You have to budge past the lengthy queue of people waiting for counter served ice cream and drool at the sundae menu as you go through to your table. It's a really cosy little place. 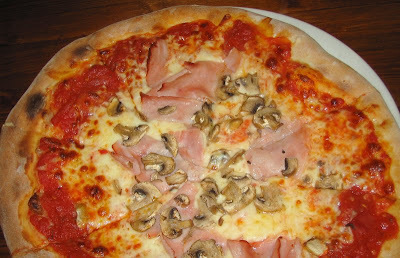 As it was lunchtime we decided to make a meal of it so also ordered one of their pizzas and a salad. The salad was good and nicely dressed and the pizza, once I had scraped half the cheese off it was...meh. They look good, the bases crisp but tasteless and not the worst I have eaten lately but what's a girl gotta do for a really decent pizza around here? Especially for almost £8. There was a steady stream of pastas, pizzas, sandwiches being ordered and breakfasts are served til 1pm but I can't say I'll be running back for the hot food anytime soon. But the reason I came here–along with practically all of Hove it seemed–was for the ice cream. This place has been open since 1969 and has created a bit of a reputation for being the best place in town for ice cream and I think it's well deserved. I like that it refuses to sell any commercial ice creams and why would it with 24 flavours of homemade Italian ice cream. 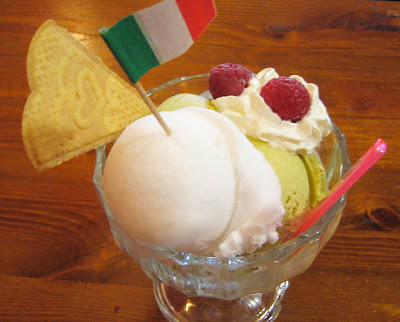 I opted for the pistachio (of course) and the lemon sorbet, both of which were fantastic and the pistachio ever so slightly pips Fusciardi's to the post as it was nuttier. Also, being the sentimental old fool that I am, I thought the Italian flag was a nice touch. Next time I'll forgoe the sensible savory lunch option and order me one of the "Gondola" ice cream sundaes as, at just a pathetic two flavours down, I don't think my work here is quite done.